We won’t let you go hungry…or thirsty. From full-plate breakfasts to a la carte lunch and dinner items, and great après appetizers in between, we’ll keep you fueled up! Our cafeteria features everything from burgers to soups to delicious fries and pizza …pretty much all your resort favorites to fill you up for a great day on the slopes! Our Skier’s Bistro serves up a variety of delicious specialty sandwiches, homemade soups (in bread bowls, of course) and great tasty items like our popular chicken and cheese quesadillas and a variety of appetizers. Open during resort hours. Our “Blockbuster Bar” offers a great selection of micro-brews on tap, plus hot apple ciders and hot chocolate drink specials to warm you up! Add to that, roaring wood stoves and an antler chandelier…it’s the perfect mountain setting for kicking back and relaxing! In addition, we have live entertainment every Saturday and during holidays. See below for our music line-up for this season. 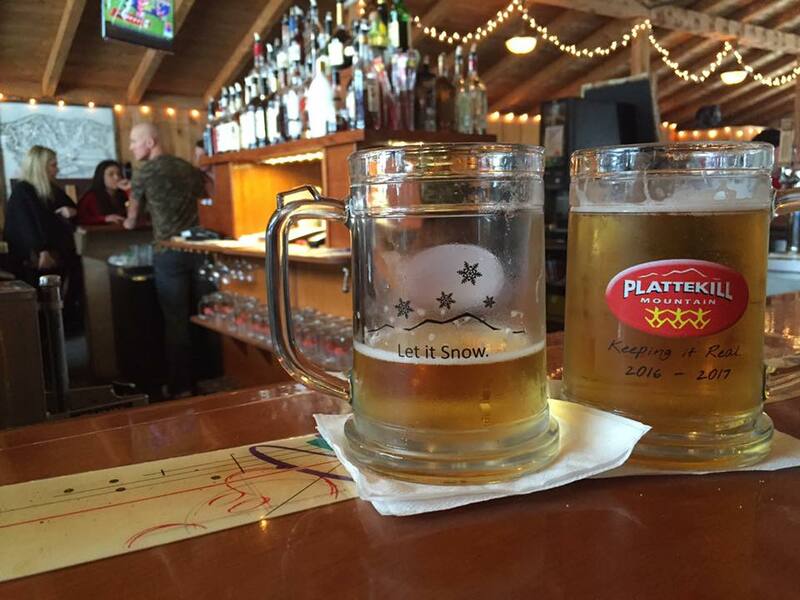 Not a skier, come for the après! 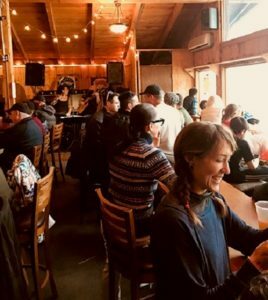 Our rustic, cozy base lodge offers a great place to have a drink or grab some food with friends whether you skied or not! Warm up next to our wood stoves and enjoy free WiFi throughout the lodge. LIVE ENTERTAINMENT is featured every Saturday 3-6pm and additional days during holiday periods. 3/2: Wyld Blu performs 6-10pm during Winterfest! 3/16: St. Platty’s Day Irish Music with McGroovin duo!